In Alan Sillitoe’s classic story of freedom, Colin Smith the protagonist is a free man by this definition and chooses to make his own history but not in conditions of his own choosing. In doing so, he exercises his free will and demonstrates his resilience and determination. Elliott Barnes-Worrell as Colin Smith certainly goes the distance and delivers an adrenaline rush in more ways than one, in this compelling and brave adaptation in a contemporary setting, of an Alan Sillitoe classic. The adaptation is by BAFTA winning and Olivier Award nominated playwright Roy Williams OBE (Sucker Punch, Fallout, Sing Yer Heart Out For The Lads). The play brings to life the biting realism that Sillitoe so vividly depicted in his 1959 novel and this production sets it in the present day. Barnes-Worrell, in his first professional performance, won me over with a superb, muscular and agitated performance, most of which is spent running on a treadmill, word-perfect and never breathless. He emerges from several long running scenes, dives straight into flashback sets without breaking sweat. You can tell he is a long distance runner in real life – and he certainly runs away with the prize for the stand-out-performance! Sillitoe, a writer with emotional power and a soul rooted in the Nottingham working class community, originally wrote this as a short story in a larger collection. The tone in the book is bleak and typically defiant, angry and bitter with occasional relief from Sillitoe’s sardonic humour, whereas this new production is much more affable. It has previously been adapted for a film of the same title, with the part of Smith played by Tom Courtenay (1962), but this version, despite following the same structure as the book and having the same central character in Colin Smith, is a world apart from both the book and the 1962 film. Whereas Sillitoe gave a new voice to the angry, white working-class, in Williams’s version which seems to be set in the black community of south London, we hear the voice and patois of the post-riot black urban youth of today; “cops” become “feds” and there are lots of “ya get me’s” and “innits” and swaggering cheeky street slang thrown in. The youth wear their pants half way down their backsides and display a very different arrogance (as well as arse) to that of a 1950’s Colin Smith. They seem to be part of a protest about young people with no prospects, instead of in a tale depicting how one can personally and defiantly handle oppression and imprisonment and gain a certain kind of freedom in a spectacular display of free will and a standoff with authority, which is how I interpreted the original story. The voice of David Cameron using the ubiquitous “L” word (legacy) and harping on about “justice” plays out from the television in the Smiths’ living room, and he sounds every bit as pompous and out-of-place and touch as he does whenever he speaks, with the gulf between “them and us” neatly illustrated. Despite one or two minor criticisms, as a fan of the writing in the original book, I thoroughly enjoyed it. It works as a new story based on an original and is skilfully produced, artistically directed (Marcus Romer), creatively scripted without being too preachy. The set is visually stunning in its simplicity and cleverly uses semi-transparent screening that allows new voices and characters on stage whilst at the same time keeping them discretely in the background. It has vitality and spirit in buckets thanks to the energetic and talented cast. To begin with, I took to my seat in the packed-out Liverpool Playhouse Theatre with a very different Colin Smith in mind (as depicted in the book) – white, working class, pale-faced, long and skinny – a not very attractive, sly, mean-spirited and defiant petty criminal from an impoverished home. The Colin I saw before me on the stage was a rather different breed – good-looking, muscular, extremely fit, moody, witty, likeable, admirable even and depicted as having the potential to change and to “turn his life around” unlike Colin the original, who was set on a life of crime. Indeed “new Colin” was so attractive that he was wolf-whistled regularly! During the after-show discussion, the row of young girls behind me could not stop whispering about and openly hankering after him! You could see him blushing and shyly enjoying the exuberant applause, and well deserved too. I do think the original script is neglected somewhat, as Sillitoe’s writing is rich with Colin’s inner dialogue, whereas this adaptation was thinner on narrative in comparison. Despite being told in the after-show discussion that 80% of the script remains true to the book, I do have my doubts about that assertion. However, it is a great piece of theatre, which like the original raises many questions in its modern portrait of a disaffected generation whilst at the same time introducing and re-marketing Sillitoe’s 50-year-old story to a completely new and younger audience. The tale jogs along as rhythmically as the runner in the form of a first person monologue with Smith introducing themes of loneliness, alienation and self-determination. It focuses on Smith, a poor teenager from a miserable home in a blue-collar area, who has bleak prospects and few interests beyond petty crime and who turns to long-distance running as a way out of his situation, which provides him with both a physical and mental escape from his surroundings. He argues frequently with his mother (played with urban sassiness by Doreene Blackstock) who is always on at him to get a job, and yearns for his dead father (Richard Pepple, who also plays mums lover Trevor) and thus belongs to the archetypal single-parent-absent father family often held up as the root of all evil by espousers of traditional family values. The addition of a love-interest in the form of the gutsy and influential Kenisha (Savannah Gordon-Liburd) brings a new dimension to the story. She introduces the possibility of another way of doing things, a different way of escaping than a life of crime and the hope of a more positive and modern ending to Smiths life, than that in the original story, where Smith develops pleurisy and continues on his one man crime spree. Some may see Smith as a working class hero standing up to the system, as he is certainly not one to follow the crowd or tug at his forelock. 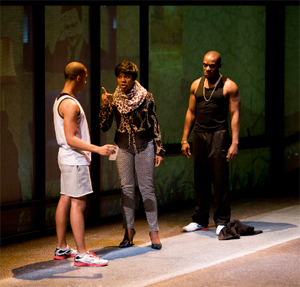 In this adaptation, we see him listening to and reflecting on the advice of his dead father who told him “everyone wants to be and no one wants to do” and who condemned the actions of the 2011 rioters in which the young Smith took no part. However, Smiths’ unrelenting attitude is as cold and frostbitten as the earth he pounds and alone with his thoughts, the question of why and for whom he runs springs to mind. In my opinion, Smith is hardly an admirable character and his anti-establishment stance serves only as a justification for his selfishness, criminality and distorted attitude to life. He never considers anyone but himself, sparing no thought to the victims of or the consequences of his crimes and in a scene with Stevens, the prison authority figure (played with a stern face by Dominic Gateley), where he demands of him “give us something new, you’re the grown-ups, fight for us” I think he displays many of the characteristics nurtured in modern day dependency culture. When caught on surveillance camera (none of those in 1950!) robbing Greggs (or these) the bakery with his friend Jase (a rather lively Jack McMullen), Smith is confined to a young offenders institution. Detained in bleak and restricted circumstances, and seeking solace in long-distance running, he attracts the attention of the authorities due to his physical prowess. Offered the prospect of early release if he wins an important race against a prominent public school, which would provide a prestigious boost to the establishment, Smith has an incentive to co-operate. 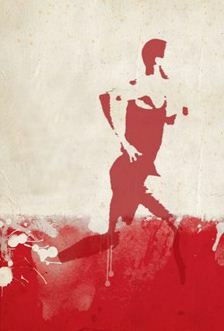 But, on the day of the competition, he deliberately stops short of the finishing line to let the other runners pass him in a defiant and deliberate gesture of contempt aimed at the repressive forces of the corrupt establishment he despises, and at the same time demonstrating a surly defiance, his free spirit, free will and independence. Smith is not easy to like, and yet because of the way in which this story was written, the audience is able to find something positive about him, and about man’s indefatigable spirit in the face of oppression. You can thank Sillitoe for this as he manages to elicit compassion for a young and selfish petty criminal, bringing out his under the surface vulnerability, his sly humour and finding within him an admirable attitude and spirit, which is characteristic of time and place. He hates the establishment and anyone associated with it, he refuses to play by anyone’s rules and he takes pleasure in exercising his own free will. An imaginative production of a 50 year old story, with dynamic performances from the rather likeable cast of robbers and rogues. Barnes-Worrell might not be breathless at the end of it, but you just might be!